This is a list of disciplinary actions taken against Fra Jozo Zovko, OFM through early 2009. It was compiled by Mark Waterinckx of Belgium. 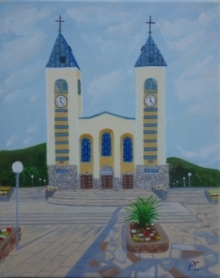 Mark had gone to Medjugorje at least 24 times and had raised many thousands of dollars. He knew Fr. Jozo Zovko personally through his promotional activities in Medjugorje before discovering sobering realities about the phenomena and the players. He has since worked actively to expose these things. For serious researchers and academics, I would encourage you to contact the Diocese of Mostar-Duvno using the reference numbers below for documents and further clarification on any particular event listed. Conclusions made in this document belong to Mark Waterinckx. The work is placed here for the sake of the chronology and document numbers. This answer is not intended as an exhaustive history, an attempt to settle allegations or open questions, much less to judge the authenticity of the apparitions. History. On June 24, 1981, six children in the town of Medjugorje, Yugoslavia (today, Bosnia-Herzegovina), began to experience phenomena which they alleged to be apparitions of the Blessed Virgin Mary. This apparition had a message of peace for the world, as well as a call to conversion, prayer and fasting. It also entrusted to the children secret messages about events to be fulfilled in the future. These "secrets," confided individually to different visionaries, have not been revealed to the public. The apparitions themselves have continued almost daily since 1981, with some of the now young adults continuing to experience them regularly (those who have not yet received all the secrets intended for them) and others not. Originally they occurred on a hilltop near the town where a large Cross commemorating the Redemption exists. They have since occurred in many other places, including the parish church, St. James, and wherever the visionaries happen to be located at the time of the apparition. The Holy Father, accepting the request of friar Tomislav Vlasic, O.F.M, member of the province of friars minor of St. Bernardino of Siena (L'Aquila), responsible for conduct harmful to ecclesial communion both in the spheres of doctrine and discipline, and under a censure of interdict, has granted him the favor of reduction to the lay state (amissio status clericalis) and of dismissal from the Order. Are pilgrimages to Medjugorje permitted or not?? ?